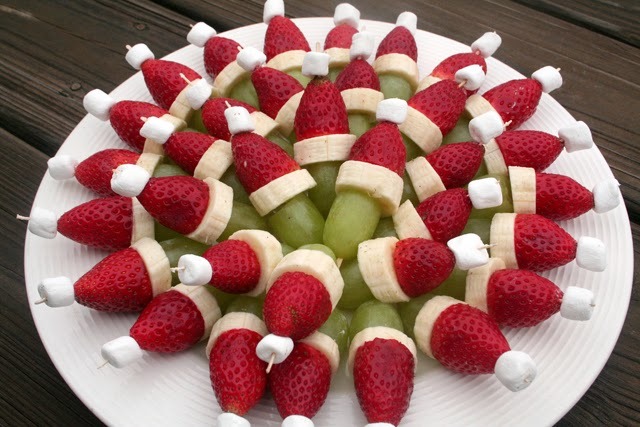 What could be cooler than Christmas themed finger food, and these Grinch Kabobs just about take the cake! Not only are they fun and delicious, but they are healthy, kid friendly and easy to make. Cut the greens and stem off the strawberries to make a flat surface. Slice off the top of the green grapes to make a flat surface. Slice the bananas into 3 millimeter slices (do one banana at a time to avoid them turning brown or squeeze some orange juice over them to keep them from discoloring). on a toothpick or mini plastic skewer place one grape (flat side up), slice of banana, strawberry (flat side meeting banana) and finally the mini marshmallow on top. Tip: Cut off both ends of the grape to make Grinch kabob that stand up, use Mini Skewers so guests can pick them up easier.